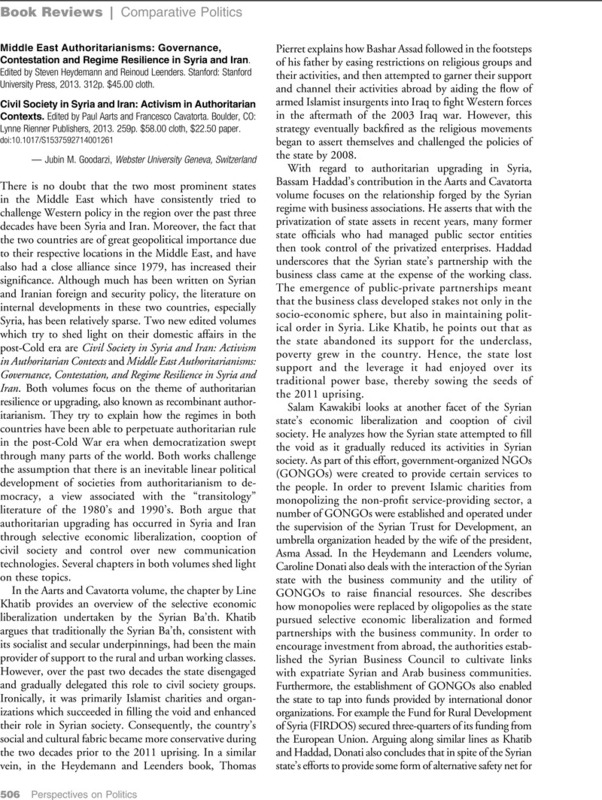 Middle East Authoritarianisms: Governance, Contestation and Regime Resilience in Syria and Iran. Edited by Steven Heydemann and Reinoud Leenders. Stanford: Stanford University Press, 2013. 312p. $45.00 cloth. - Civil Society in Syria and Iran: Activism in Authoritarian Contexts. Edited by Paul Aarts and Francesco Cavatorta. Boulder, CO: Lynne Rienner Publishers, 2013. 259p. $58.00 cloth, $22.50 paper.